Here is the solution how to create a Shutdown or Restart shortcut for Windows 10, for example on the Windows 10 Desktop! See also: ► Auto login withot Password! Hot-Tip:► ... Enable Shutdown feature in Windows To-Tray area! Download ....Restart, Shutdown, Logout, Sleep, Windows-10.zip! Tip: You can shut down the Windows computer by, for example, holding down the power button on the system unit or on the laptop for a few seconds (3 to 7). It should be noted that this method is not secure and can damage system files. It can only be used in extreme cases when the Windows 10 is completely frozen and there is no way to restart the PC in any other way. (Image-1) Shutdown-Restart-LogOut-Lock Shortcut for Windows 10! 2.) Pin the Desktop Shortcut to Windows-10 Start. Please right click on the desktop shortcut and select "Pin to Start" (... See Image-2 Arrow-1). Press the [Win-Logo] key to see the result (... See Image-3 Arrow-1). Tip: Hibernation stops the power supply of the hardware in contrast to the standby mode. A hibernation feature is the preservation of data stored in the computer's memory on a hard disk. If work continues on Windows 10, the data will be restored so that you can continue working in the same place. See ► Hybrid Sleep Settings in Windows 10! (Image-2) Pin Shutdown-Restart-Lock-Log-Off on Windows-10 Start! (Image-3) Shutdown - Restart in Windows 10 Start! There are several ways to shut down the computer on Windows 10, which can shut down the operating system properly. This reduces the likelihood that individual programs and the entire platform will be out of service. See also: ► Adjust screen brightness on Window-10 tablet PC via Mobility Center! This FAQ explains how to easily create a useful Windows 10 shortcut regardless of whether it is an administrator account or a basic user account. Thus, you can also on tablets that have no keyboard your Windows 10 operating system shut down quickly, log off, reboots, or lock the system, this instruction is written for Windows 10, but you can apply it to earlier versions of the operating system. Windows-10 - FAQ-43: Shutdown - Restart shortcut Windows 10, how to create? The solution is simple to change the Hibernation settings in Windows 10, turn off, turn on, or disable completely if required Content / Example / Tip: 1. How to shut down windows 10 system with shortcut? System reset windows 10 shortcut key? How to make a shutdown shortcut button for windows 10? Can't logout of my pc windows 10 from the desktop? How to create a shutdown shortcut in windows 10? How do i restore shutdown button on desktop windows 10? Shortcut key to trun display in pc for windows 10? Shortcut for restart windows 10? Shortcut windows 10 shutdown, Windows 10 add pic in shut down? How to create a restart button in windows 10? How can i get windows 10 to shut down? Windows 10 shutdown button or Shortcut to power button windows 10? Shortcut to power off windows 10 or Shortcut key to shut? Log off shortcut windows 10 and Restart shortcut? Create shutdown button on desktop windows 10? 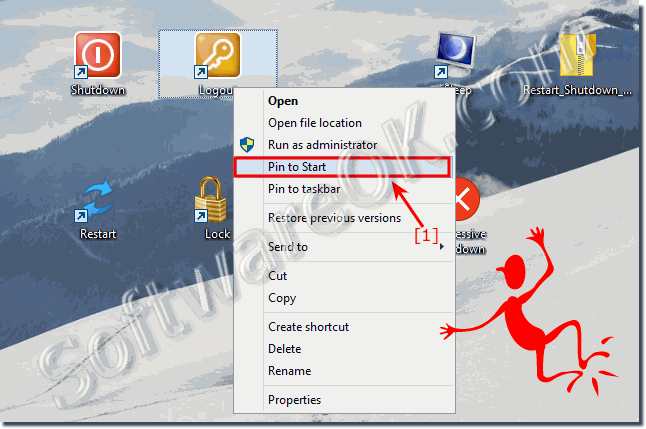 How to create and Pin Shutdown Button on taskbar & on start screen-Windows 10? How to make a shortcut to restart windows 10?